For a fast quote we just need bag size and quantity. With this info beget you a price quickly and easily. We provide a template that your bag artwork will need to be formatted to. Upon receiving your artwork, Blue Line Labels will review, print and manufacture 2 copies of each bag design. The sample will be shipped to you. The bag proof you will receive is a real deal sample. This is what your bag order will look like. Examine your bag proof carefully for copy and color. Stand up pouches from Blue Line Labels are a great solution for packaging a variety of food products. Our flat pouches are a perfect solution for single servings. Give us a call at 1-800-609-7079 to discuss your next pouch project. Flexible sachets and sticks packs are a convenient way to promote samples of your product. 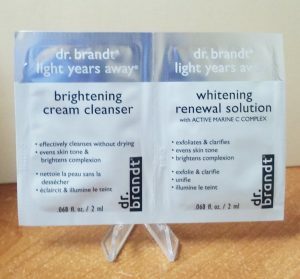 Each sample pouch will contain a one time use of a predetermined amount based on the use and area of the body applied. Complimentary samples sachets can hold as little as 1 ml up to 120 ml of product. Lot numbers and expiration dates are typical information added. Several layers of film will be determined with a custom printed top coat, crimped together to hold a one time use of hair gels, shampoos, conditioners, ointments, moisturizers, sunscreens, skincare creams and much more. Understanding The Correct Process to Place an Order for Sachets. Please allow 2-3 months from start to finish to produce your sample pouches/sachets. Complex accelerated aging tests for stability of your product and testing the correct liner/barrier for maximum shelf life are the 2 main steps. 1. Send 12 ounces of each product that will be sampled. 2. We will need to do a free stability test. This is a laboratory procedure to determine what liner material will be used as the barrier layer to preserve shelf life for 1 year. Each week, we will take a look at how testing is going. Film begins deteriorating by the second week, then third and so on until we can determine which film works best with what is going into the film. 3. This is a 6-12 week study, but in the meantime, we proceed with artwork. 4. We will determine the correct film layers to ensure the properties of your product remains intact with the correct expiration date. 5. Blue Line Labels will format your layout artwork. We work closely with a FDA/OTC certified laboratory for testing, printing of the film and adding your product. You will receive a final product on-time, produced correctly and excellent pricing. Pricing is very specific for each project. We can develop a price estimate with the following details: Number of Colors Printed, Product Type, Fill Amount, Overall Size/Shape. With digital and flexo printing equipment capabilities we are able to produce your sample packets in quantities as few as 2,500 to 10,000,000. Just like a tandem bicycle when two people ride together, we offer a two pack for your product offerings. 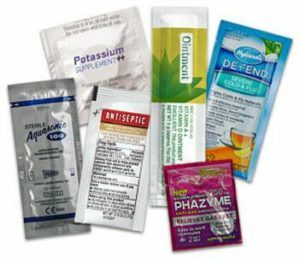 Each sample product connects with a full vertical perforation to make to easy to pull apart and use each pouch when needed. Fantastic quality printing of your graphics and message is what we can provide you when purchasing your sachets and pouches from Blue Line Labels. We are a hassle free fulfilment partner that works closely with several quality vendors. Whether you’re simply looking for a high quality printer to produce your flexible packaging or prefer a worry-free one-stop shop. We are here to help. Flexible stick packs are rectangular pouches that are sealed on each short end after vertically filled and sealed. Perfect packaging for many industries. Stick packs are very popular as a single serve pouch designed to let consumers prepare drinks easily and without a mess. 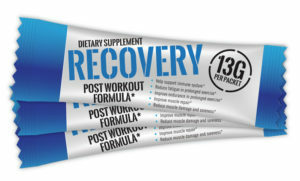 Pick up a protein/energy bar and almost always they are packaged in a stick pack. Based on the product being used for a custom stick pack we can design the width, length and depth to create a visually tempting package design. The production of stick packs became a great choice because of the economical unit price in single portable pouches and extended shelf life for the food industry, give aways at trade shows, cosmetic give aways in glam bags and many convenient applications. Very convenient solution for many food, nutraceutical and pharmaceutical companies whom manufacturers single serving or unit dose in single portable pouches. Blue Line Labels will make sure your cosmetic product has been studies and evaluated to be produced with the right barrier structure and has been fully tested for maximum shelf life and compatibility. With a large variety of flexible packaging films we have many options. We are able to get you the packet, pouch or shrink films in a variety of materials. Easy to tear perforation with your choice of ultra-high barrier films, ultra-white, barex, matte films, and firmer magazine films are just some of the available options. From print to fill, we ‘make it easy’, and guarantee you’ll have a worry free experience. Let us handle your pouch project from start to finish for a quality job! Give us a call at 1-800-609-7079 to discuss your next cosmetic project.